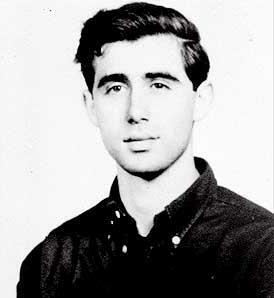 Andrew Goodman (November 23, 1943, – June 21, 1964) was one of three American civil rights activists murdered near Philadelphia, Mississippi, during Freedom Summer in 1964 by members of the Ku Klux Klan. Andrew Goodman was born and raised on the Upper West Side of New York City, at 161 West 86 Street. He was the middle of three sons of Robert and Carolyn Goodman, and of Jewish heritage. His family and community were steeped in intellectual and socially progressive activism and were devoted to social justice. An activist at an early age, Goodman graduated from the progressive Walden School, which was said to have had a strongly formative influence on his outlook. He attended the Honors Program at the University of Wisconsin–Madison for a semester but withdrew after falling ill with pneumonia. Goodman then enrolled at Queens College, New York City, where he was a friend and classmate of Paul Simon. With Goodman's brief experience as an Off-Broadway actor, he originally planned to study drama but switched to anthropology. Goodman's growing interest in anthropology seemed to parallel his increasing political seriousness. In 1964, Goodman volunteered along with fellow activist Mickey Schwerner to work on the "Freedom Summer" project of the Congress of Racial Equality (CORE) to register blacks to vote in Mississippi. Having protested U.S. President Lyndon Johnson's presence at the opening of that year's World's Fair, Goodman left New York to train and develop civil rights strategies at Western College for Women (now part of Miami University) in Oxford, Ohio. In mid-June, Goodman joined Schwerner in Meridian, Mississippi, where the latter was designated head of the field office. They worked on registering blacks in rural areas to vote. The Mississippi State Sovereignty Commission was strongly opposed to integration and civil rights. It paid spies to identify citizens suspected of activism, especially northerners who entered the state. The records opened by court order in 1998 also revealed the state's deep complicity in Chaney, Goodman, and Schwerner's murders, because its investigator A.L. Hopkins passed on to the Commission information about the workers, including the car license number of a new civil rights worker. Records showed the Commission, in turn, passed on the information to the SNeshoba County Sheriff, who was implicated in the murders. Schwerner had been working closely with an assistant James Chaney, also a civil rights activist in Meridian. On the morning of June 21, 1964, the three men set out for Philadelphia, Neshoba County, where they were to investigate the recent burning of Mount Zion Methodist Church, a black church that had agreed to be a site for a religious school for education and voter registration. 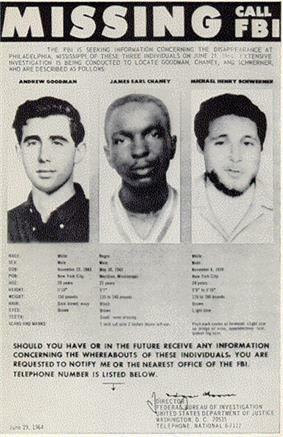 Missing persons poster created by the FBI in 1964, shows the photographs of Andrew Goodman, James Chaney, and Michael Schwerner. On their return to Meridian, the three men were stopped and arrested by Deputy Sheriff Cecil Price (a Klan member) for allegedly driving 35 miles over the 30-mile-per-hour speed limit. The trio was taken to the jail in Neshoba County where Chaney was booked for speeding, while Schwerner and Goodman were booked "for investigation". After Chaney was fined $20, the three men were released and told to leave the county. Price followed them in his patrol car. At 10:25, Price sped to catch up with the station wagon before it crossed the border into the relative safety of Lauderdale County. Price ordered the three out of their car and into his. He then drove them to a deserted area on Rock Cut Road while being followed by two cars filled with other Klansmen. He then turned them over to the Klansmen who beat Chaney and then shot and killed Schwerner, Goodman, and Chaney. The FBI entered the case after the men disappeared. They helped find them buried in an earthen dam. The US government prosecuted the case under the 1870 Force Act. The Neshoba County deputy sheriff and six conspirators were convicted by Federal prosecutors of civil rights violations but were not convicted of murder. Two defendants were acquitted because of jury deadlock. Journalist Jerry Mitchell, an award-winning investigative reporter for the Jackson Clarion-Ledger, had written extensively about the case for many years. Mitchell, who had already earned fame for helping secure convictions in several other high-profile Civil Rights Era murder cases, including the assassination of Medgar Evers, the Birmingham Church Bombing, and the murder of Vernon Dahmer, developed new evidence, found new witnesses and pressured the State to take action. Barry Bradford, an Illinois high-school teacher later famous for helping clear the name of Civil Rights martyr Clyde Kennard, and three students, Allison Nichols, Sarah Siegel, and Brittany Saltiel, joined Mitchell's efforts. Their documentary, produced for the National History Day contest, presented important new evidence and compelling reasons for reopening the case. They also obtained an interview with Edgar Ray Killen, which helped persuade the state to open the case for investigation. Mitchell was able to determine the identity of "Mr. X", the mystery informer who had helped the FBI discover the bodies and smash the conspiracy of the Klan in 1964, in part using evidence developed by Bradford and the students. On September 14, 2004 Mississippi State Attorney General Jim Hood announced that he was gathering evidence for a charge of murder and intended to take the case to a grand jury. On January 7, 2005, Edgar Ray Killen was arrested. He was found guilty of three counts of manslaughter — not murder — on June 21, 2005, exactly 41 years to the day after the murders. He was sentenced to sixty years in prison—twenty years for each count, served consecutively. In 2002, a 2,176-foot peak in the Adirondack Mountains town of Tupper Lake, New York, was officially named Goodman Mountain in Goodman's memory. Goodman's family had spent summers there for 30 years. The Walden School, in Manhattan, named its middle and upper school building in Goodman's memory. The Trevor Day School now occupies the building and has maintained the building's name as the "Andrew Goodman Building". Goodman's parents set up the Andrew Goodman Foundation to support work for social justice. Goodman, along with Cheney and Schwerner, received a posthumous Presidential Medal of Freedom from President Barack Obama in 2014. Numerous works portray or reference the stories of Chaney, Goodman, and Schwerner, and the aftermath of their murders. See Mississippi_civil_rights_workers'_murders#Cultural_references. ^ Slater, Anna (June 21, 2011). "On this day: Michael Schwerner and Andrew Goodman killed". ^ "Andrew Goodman, activist who gave his life!". ^ AP (18 March 1998). "Mississippi Commission's Files a Treasure Trove of Innuendo". MDCBowen.org. Retrieved 9 May 2008. ^ Linder, Douglas (August 2000). "The "Mississippi Burning" Trial (U. S. vs. Price et al.)". ^ "A Sacrifice in Mississippi Remembered on a New York Mountain". The New York Times. October 6, 2002.